Breathtaking views of mountains and valleys. From Wears Valley Road drive to Townsend, TN and turn right onto Lamar Alexander Parkway. Travel 10.2 miles to Foothills Parkway on your left. 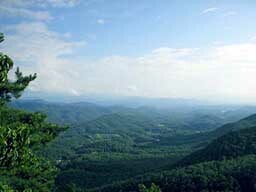 The Parkway has many scenic views of mountain vistas and expansive valleys. Sunrises and sunsets are breathtaking along this route. You will discover a climbing tower which provides a marvelous aerial view of the Smoky Mountains and of nearby Maryville, TN. 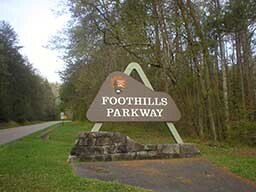 Foothills Parkways ends at Chilhowee Lake on U.S. Hwy 129. 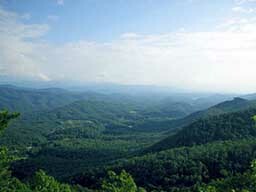 Hwy 129 is the Tennessee entrance to the notorious The Tale of the Dragon.